Molly took the kids grocery shopping today. The kids were riding in one of those big car carts that take up the whole aisle. Sofi was riding in the car part, closest to the ground, and Henry was riding in the traditional cart seat. All was well, they got some pizza, soup, fruit, veggies, doughnuts from the bakery (yum! ), milk, oj, and all sorts of other things you would expect to get from the grocery store. All was going well until, while Molly was loading the groceries in to the car, Henry asked, "What does Sofi have?" Well, being so close to the ground, which also made her be a bit out of sight, Sofi realized that she was at the perfect height to reach out and grab candy from those troublesome shelves at the checkout lines. What did she find? Rolos. And she destroyed them. So, nearly 4 years into fatherhood, I can proudly say that my daughter is a shoplifter. 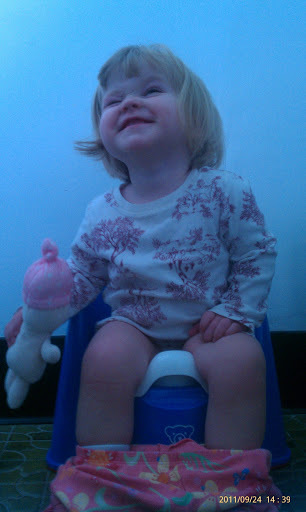 Oh, and remember when Sofi loved sitting on the potty the other day?